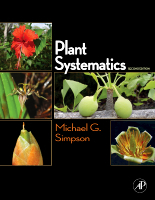 Welcome to the website for Simpson, M: Plant Systematics, 2nd Edition. The website for the second edition of Plant Systematics contains a variety of resources, including ancillary material and figures from the book. A link to the author's website is also provided. The author's website includes additional teaching resources, plant images and videoclips, list of literature and professional societies, and much more. Author's website includes additional teaching resources, plant images and videoclips, list of literature and professional societies, and much more.